If you are like most of us, there is a pretty good chance you have desk posture and back pain. It’s likely that your occupation requires you to sit at a desk for a prolonged period of time. 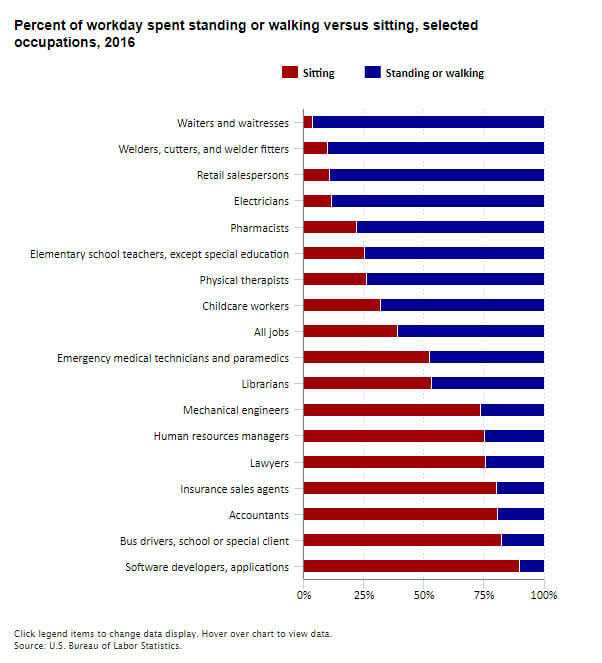 Referring to the chart below, occupations such as software developers spent an average of 90.0 percent of their workday sitting in 2016. Other occupations in which workers sit most of the day include bus drivers, school or special client, who spent an average of 82.4 percent of their workday sitting, accountants (80.7 percent), and insurance sales agents (80.3 percent). Prolonged hours of sitting at your desk is no good! A common complaint from many of my desk-job clients is often a negative feeling of discomfort, achiness, and pain around the mid-back (thoracic spine). Most people would ignore this discomfort and continue their poor sitting habits for months and years! It is important to realize that our bodies are very adaptable to our daily habits and lifestyle. Hence our spine and surrounding structures will continue to adapt to the everyday-position you put it in! Years of sitting in a static position will start off as an ache, to discomfort, to eventually pain and possible structural changes. Additionally, prolonged sitting in the same position can affect other aspects of your health as well. A report by the American Academy of Physical Medicine and Rehabilitation (2006) concluded that leaning over at your desk for hours can affect your breathing, lung capacity, and blood flow. Think about your main breathing muscle, the diaphragm, being restricted and compressed when you are leaning over at your desk for hours. A restricted diaphragm = decreased lung function, which means less oxygen into your body, which can lead to less overall energy and body function. I don’t know about you, but that’s enough convincing for me to learn how to improve this issue! To explore this further, let’s dig into some anatomy. A natural thoracic (mid-back) kyphotic curve is anywhere between 20 to 40 degrees, but it can start causing problems when that angle increases to 40-45 degrees. 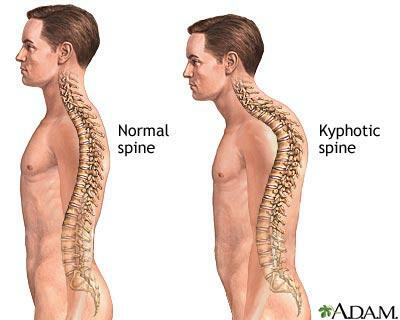 This is usually referred to as kyphosis. At this point, this excessive kyphosis can affect other structures such as your neck, shoulders, and lower back. Keep in mind, we are currently discussing postural (functional) kyphosis rather than structural/congenital kyphosis. Postural (functional) kyphosis is more common than structural and often caused by a gradual build-up of poor desk-sitting posture. Additionally, the spine is surrounded by other structures (e.g. muscles) which can further aggravate your symptoms. Tightness and shortening of muscles in your chest and abdomen are often involved in kyphosis, further rounding your shoulders forward. On the other side, lengthening and weakness of your posterior back muscles like thoracic extensors, middle/lower trapezius, and the rhomboids can also contribute. You may have heard the term ‘Upper Cross Syndrome’ to describe this. Ignoring these muscular imbalances may lead to future shoulder, neck, and elbow problems. On the bright side, postural ‘functional’ kyphosis of the spine can often be addressed with strengthening and mobility exercises! Here’s your chance to re-gain control of your body by learning to fix your postural issues! The spectacular thing about these desk posture exercises is the fact that you can perform these at the convenience of your desk! Ideally you would want to take frequent standing/movement breaks, but if you are on a time crunch at work, these desk posture exercises will work perfectly. Slide your buttocks to the back of the chair and keep your desk posture spine tall. Place your hand behind your neck, keeping the spine tall and lengthened. Keeping your feet planted and back pressed against the chair, bend your back through the mid-back area. Exhale and return to tall sitting posture. Repeat 5-8 times, every 2-3 hours! Do not continue if you feel increased pain and/or discomfort. Slide your buttocks to the back the chair, keeping your spine tall. Keeping your hips square and both buttocks on the chair, turn the upper body one side, inhaling and exhaling as you turn further into the stretch. Hold each stretch for 2-3 deep breaths and repeat on the other side. Sit upright with shoulders relaxed, head level and eyes looking straight ahead. Slide your buttocks forward, making sure your back isn’t touching the back of the chair. Place your hands on your pelvic bone. Drop your trunk down while letting the pelvis tip down and back as if you are slumping. Then sit up straight, tilting the pelvis slightly forward and bringing the breastbone up and forward, making you stretch your back upright. You should feel that your weight comes forward over the hips. Repeat 6-8 times every 2 hours! Sit on the edge of the chair, with your feet flat on the ground. Stay upright, shoulders back, chest up, abdominals engaged with your arms relaxed at your sides. Rotate your arms so the palms face the outside and the thumbs are pointed behind you. 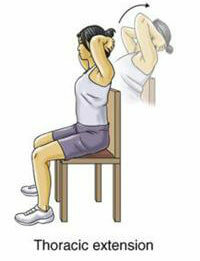 From here, think about pinching/drawing your shoulder blades together, drawing them down toward the middle of your back. Continue to breathe normally and hold this position for 20-30 seconds, repeating this exercise 3-4 times throughout the day. Modern living with constant technological advances have created a generation of occupation workers with desk jobs. Remember that desk occupations are not the enemy, rather they can often be a negative catalyst for poor sitting and sedentary habits. Sitting is not the real issue but placing your body in one static position for prolonged periods is. Remember that our body prefers constant movement in order to decrease pain and aches! These exercises will help to create postural awareness, increase lung efficiency, improve energy levels, and may fix the nagging ache in your back. Give them a try, be consistent, and most importantly don’t expect overnight results! Sit less, move often. Disclaimer: Do not treat this as medical advice as it is used for educational purposes only. If you are having pain or health-related complaints, please seek out a licensed healthcare professional. Reference: Lin, Fang, et al. “Effect of different sitting postures on lung capacity, expiratory flow, and lumbar lordosis.” Archives of physical medicine and rehabilitation 87.4 (2006): 504-509. Find out a treatment and training program to fix your desk posture.